In a large bowl or bowl of a stand mixer fixed with paddle attachment, stir together cookie mix, butter, 1 tablespoon flour and egg until a soft dough forms. Remove dough from bowl and divide into three pieces, two of equal size and one about 1/3 the size of the other two. Place one of the larger pieces back in the bowl; place other two pieces in fridge. Add green food coloring and 1 tablespoon flour to the bowl. Stir together until dough turns adequately and evenly green. Shape dough in a ball and cover with plastic wrap; place in fridge. Clean out bowl and place smallest piece of dough in bowl. Whisk cocoa powder with 1/2 teaspoon water until it forms a thick paste (add more water if necessary); add to bowl. Add remaining 2 teaspoons flour and stir together until dough turns adaquately and evenly brown. Shape dough into a ball and cover with plastic wrap; place in fridge. Remove remaining, plain piece of dough from fridge; shape into a ball and cover with plastic wrap; return to fridge. Let all three doughs cool in fridge 30 minutes. Remove dough from fridge. On a floured surface, divide plain dough in thirds, one piece being half the size of the other two. Roll out one of the larger pieces into an even, 8-inch long log to form the face. Divide the cocoa dough in quarters and roll out two quarters into 8-inch logs, placing on top of the face to form the eyes. Quickly roll out the smallest piece of plain dough into an 8-inch log and place between the eyes to keep them in place. Roll and stretch remaining piece of plain dough over the whole dough to lock everything in place. Take last two quarters of cocoa dough and roll into 8-inch logs to form the ears. Divide green dough in two pieces, one twice the size of the other. Take the small piece and roll into an 8-inch log to fill in the space between the ears. Take the larger piece of green dough and roll and stretch over the whole dough to lock everything in place. Cover entire log in plastic wrap and place in freezer 20 minutes. Remove dough from freezer and plastic wrap. With a sharp, clean knife, cut dough into 1/4-inch slices and place 2 inches apart on prepared baking sheets. Bake 7-10 minutes until cookies are a light golden brown. Remove from oven and let cool 1 minute before transferring to a cooling rack. Pipe chocolate frosting noses and mouths onto cooled cookies before serving. It’s one thing to bake cookies, which I already love. 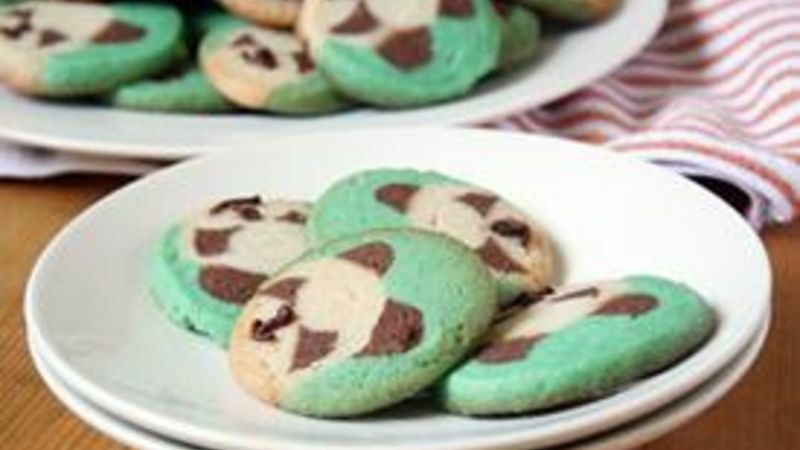 It’s another (awesome) thing entirely to bake cookies with a panda’s face in them! You heard right – after baking a panda’s face into a loaf of bread, why not bake them into sweet, sugary cookies? These adorable Panda Cookies are a fun way to get some real “face” time with a classic sugar cookie recipe (heh heh heh… aaaand enough sugar cookies for me). First, make the cookie dough, then divide in thirds. Dye one dough green, another brown and keep a third plain. Cover with plastic wrap and refrigerate so the dough is easier to handle. Next, we make the face! Take a deep breath – if you follow these photos plus the step-by-step instructions in the recipe, you can get through the toughest part and come out on the other end with yummy, sugary, panda face cookies! First, form the face with plain dough, and cocoa dough for the eyes. Be sure to roll each piece out evenly into 8-inch logs so the face is similar throughout the dough. Then add the green dough to lock everything in place. Freeze the log of dough for a few minutes so it’s easier to slice and bake. Once your cookies have cooled, pipe on some Betty Crocker chocolate frosting to make cute little noses and mouths. That’s all there is to it. Whether it’s for a fun, animal-themed birthday party, an upcoming Earth Day celebration or because you just can’t get enough of pandas, these creature cookies are great for any occasion!